Cell phones are great; but what happens when you can’t get a signal? If you’ve ever been stuck in a dead zone, you know how frustrating it can be; even worse than the frustration, not having access to a cell signal can put you in a serious predicament if an emergency arises. That’s why you should consider investing in a two-way radio. They don’t require cellular connectivity, so there’s no need to worry about dead zones. These devices are great for staying connected if you spend a lot of time in the wilderness or any other location where it’s hard to access a cell signal. Handheld two-way radios, or walkie talkies, are handheld, portable devices; similar to ham radios or more specifically, handheld ham radios. that offer great range, which means that you can communicate with people far away, no matter where you are located. They send and receive radio signals, which means that you can stay connected in remote locations; hence the reason why they are such great tools. Which one should you choose? Read through the following reviews to learn more about each device. When you’ve decided on an option and you’re ready to make a purchase, click on the yellow link to find the best prices currently available on Amazon. First up on our list of the best two-way radios are the Arcshell Rechargeable Long Range Two-Way Radios. These devices are compact in size, lightweight, and come with all of the features that you need in order to stay connected. Measuring just 4.53 inches tall (not including the antenna) and weighing only 6.3 ounces, these devices are small enough to fit in your hand or to attach to your belt without getting in your way or weighing you down. They are made of extremely durable materials and are water-resistant, so you’ll have peace of mind knowing that can handle wear-and-tear with ease. The frequency range on these units is UHF 400-470MHz, so they offer plenty of power. They’re also pre-programmed with 16 channels and each device (there are four in total) has the same exact frequency on all 16 channels, so you’ll always be connected. Plus, every radio features a 16 position mechanical rotary channel selector and when you change the channel, a voice tells you what channel you are on. All four radios are powered by a 1500mAh rechargeable li-ion battery; when they need to be charged up, just put them on the charging dock and they’ll be fully charged in around 2.5 hours. Fully charged batteries run up to 96 hours. The speakers and microphones provide clear, crisp communication; and, they come with a single two-way radio headset and earpiece for total convenience. Final Verdict: The Arcshell Rechargeable Long Range Two-Way Radios are a great way to stay connected when you’re in remote locations. They offer long-range communication, they’re easy to use, and they’re durably built; plus, they’re quite affordable. Motorola is one of the most reputable manufacturers of high-quality communication devices, and their T260 Talkabout Radio is definitely no exception. You’ll be able to stay connected in remote locations, plus, you’ll have access to live weather updates so you can make appropriate accommodations if an impending storm is on the horizon. 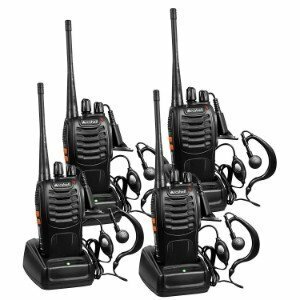 These walkie talkies are lightweight and easy to use, and they are outfitted with a variety of features that will make them easy and enjoyable to use. Both units feature 11 weather channels and receive weather alerts from NOAA, so you’ll always be able to stay on top of the latest forecast. Thanks to the scanning feature, you can find what channels are in use with ease. You can choose to power these two-way radios with the rechargeable NiMH batters, which are included and last for up to 10 hours on a full charge, or you can use three AA batteries, which will power the devices for approximately 29 hours. Whichever option you choose, when you’re running low on power, the low battery alert will let you know when it’s time to charge up or change. Each handheld two-way radio boasts 22 channels and 121 privacy codes, offering a total of 2,662 combinations. Lastly, you’ll be able to communicate with any FRS/GMRS radio. According to the reviews that we read, most users are very happy with these two-way radios. The majority of customers were happy with their quality, durability, affordability, and ease of use. Final Verdict: With the Motorola T260 Talkabout Radio, communication in remote areas is a breeze; plus, you’ll be able to receive the latest weather updates so you can stay out of any impending storms. The next option on our list of the best two-way radios is the Midland – GXT1000VP4. 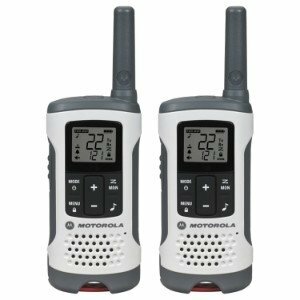 This package comes with two durable, waterproof, feature-rich walkie talkies that are affordable, easy to use, and work over 36 mile range. These devices boast 50 GMRS channels, as well as a scan feature, which lets you see which channels are active. If used in open areas without any obstructions, they have a 36 mile range, so you can stay in touch over long distance. Easy Voice and Sound Recognition (eVO), complete with nine sensitivity levels, allows for convenient hands-free operation. There are 142 CTCSS/DCS privacy codes, which gives up a total of 3,124 channel combinations so that you can have the most discrete conversation. The NOAA weather scan and alert automatically scans 10 different weather band channels and connects to the strongest channel and lets you know when impending storms are in the forecast. These walkie talkies are powered by rechargeable batteries, which are included. They also come with boom mic headsets, belt clips, an AC and a DC power adapter, and a 120 volt dual desktop charger. Based on the reviews that we have read, it seems like most people who have used these devices are happy with their purchase. They say that they’re durable and offer plenty of features that make them easy to use. Final Verdict: With the Midland-GXT1000VP4 two-way radios, you’ll be able to communicate over a 36 mile range (in unobstructed areas); plus, you’ll be able to keep your conversations private, thanks to the more than 3,000 channel combinations, and you’ll get instant alerts on upcoming storms. 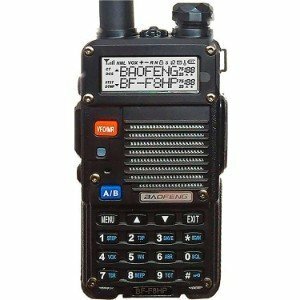 Next, we have the BaoFeng BF-F8HP (UV-5R 3rd Gen) 8-Watt Dual Band Two-Way Radio. It’s the upgraded model of the manufacturers previous generation, the UV-5R and offers twice as much output and even better durability. This model offers double the output power of the UV-5R; 8 watts as opposed to 4. The upgraded shell is harder than the last model, so you’ll have peace of mind knowing that it can withstand even more wear and tear. Plus, the battery is 30 percent larger than the UV-5R, so you’ll be powered up even longer. Last for the upgrades is the high grain antenna, which offers double the performance so you’ll be able to connect over even greater distances. This device offers three power settings: high (8 watts), medium (4 watts) and low (1 watt). It has a frequency range of 65-108 MHz on commercial FM radio reception, on VHF, the range is 136-174 MHz), and on UHF, the range is 400-520 MHz. You can also choose broad or narrow range; whichever you prefer. There’s also a built-in flashlight, so if you get stuck in the dark, you’ll have a light source right in your hand. Programming this device is extremely easy, thanks to the easy to read user manual. If you get stuck, you can take advantage of the one year complimentary concierge support that comes with the device. 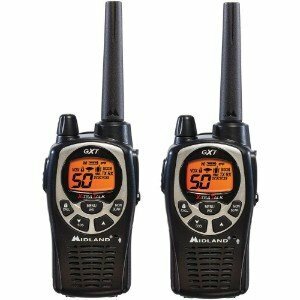 Based on the reviews that we read, most people who have purchased this two-way radio are quite happy with it. Many noted that they liked the upgrades and that it offers great range. They also said that the concierge service made it very easy to use. Final Verdict: The BaoFeng BF0F8HP (UV-5R 3rd Gen) 8-Watt Dual Band Two-Way Radio was designed with ease of use in mind. It comes with 1 year of concierge support and a detailed owner’s manual; plus, it offers great power and range for long distance communication. 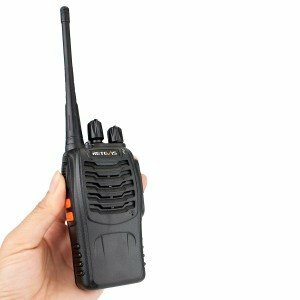 Last on our list of the best two-way radios is the Retevis H-77 Two Way Radios UHF Radio. If you need to stay in touch with a large group of people, this is a great option for you. It comes with a total of 10 walkie talkies, so you and all of your buddies will be able to stay connected in remote locations. All 10 of the devices that come with this set are set to the same frequency and the same channel so that they can instantly communicate with one another. The voice prompt function makes them super easy to use; use it to change the channel or to find the channel that your group is using. Each walkie talkie features a built-in flashlight, which comes in really useful when the sun goes down or if you’re in low-lighting. Charging up is easy, thanks to the USB charging station that comes with the set. There are a total of 16 channels and 50 privacy codes, which gives you plenty of options to have a private conversation. According to the reviews that we read, most of the people who have used these walkie talkies are happy with them. Many customers said that they offered pretty clear transmission, that they were easy to use, and that they were very lightweight. Final Verdict: The Retevis H-777 Two Way Radios UHF Radio 2 Way Radio is an excellent choice for anyone who needs to stay in touch with a large group of people. This set comes with 10 well made walkie talkies that boast all of the basic features that you could need. Two-way radios are extremely useful devices, as they allow you to communicate in remote areas where cell phone reception is limited or lacking. These devices are often used by hunters, hikers, or on work sites; however, you can use them in any situation that requires a reliable connection. This refers to the distance that the two-way radios will work over. Some devices only work over a short range; 8 miles, for example; however, some have a range that exceeds 32 miles. Consider how far away you’ll tend to be when you’re using these devices to determine what type of range you need. The power of the device can enhance its range. The more wattage, the better the range will be. The more channels, the more options you’ll have. On average, two-way radios have 22 channels and 121 privacy codes; however, there are some options that have more and some that have less. The more channels and privacy codes there are, the more options you’ll have for a private conversation. A two-way radio is an excellent device to have on-hand. It serves as a reliable form of communication that will keep you connected in remote locations.